I have not been able to post to the blog for a month! Others could see the blog, but I couldn’t see it or post to it! Suffice it to say, AT&T and I are not going to be having tea together any time soon! Stampin’ Up is celebrating with their new Occasions Catalog and now through the end of the month is Sale-A-Bration. That means for every $50 in product purchase, you get to choose an item from the Sale-A-Bration catalog for free. Leave me a message is you would like to see a catalog or click on the link to my Stampin’ Up blog in the upper righthand corner. There are links to the Occasions and Sale-A-Bration catalogs on that page. I have several cards to share. The first one is made from the darling HONEYCOMB HAPPINESS stamp set, Birthday Bouquet Design Series Paper, and Honeycomb embellishments. The set also includes the cutest little Chick. You can find this set on page 15 of the Sale-A-Bration catalogue. Thank you for visiting. I’ll be back tomorrow with more samples. I would be honored if you would like to enter you email to be a blog follower! 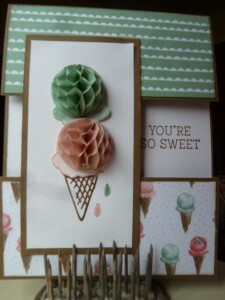 This entry was posted in SU Only and tagged Birthday Bouquet Designer Series Paper, Honeycomb Embellishments, Honeycomb Happiness Stamp Set. Bookmark the permalink. 2 Responses to HURRAY! Blog is back! Gorgeous Kaye, so glad you got your blog back! Emma! We need to set up a play date!